Iris 8 Panel Exercise Pet Pen with Door Review - Why you'll love it? Iris 8 Panel Exercise Pet Pen with Door – Why dog owners like you love it? Iris 8 Panel Exercise Pet Pen with Door has remarkable features and its versatility makes it one of the best purchases for your dog. Let’s dive in and find out more. Once you take a look at the immense space and the durability that the manufacturer provides, you wouldn’t be able to stop yourself from making this amazing purchase. In this Iris 8 panel exercise pet pen with door review, I am going to highlight the key features along with pros and cons. When you are finished reading this review, it would be much easier to make a firm decision. Just by looking at the image of the Iris 8 Panel Exercise Pet Pen I can say that it is kind of a tiny home for your pet. It is portable and provides a large area for your dog to get ample of exercise. Owners can easily carry it around and put it both outdoors and indoors. If you are working in the kitchen, you need not worry about your pet’s safety. You can carry it wherever you are working and keep an eye on your pet. If you are going on an outing, you don’t need to leave behind your precious friend. 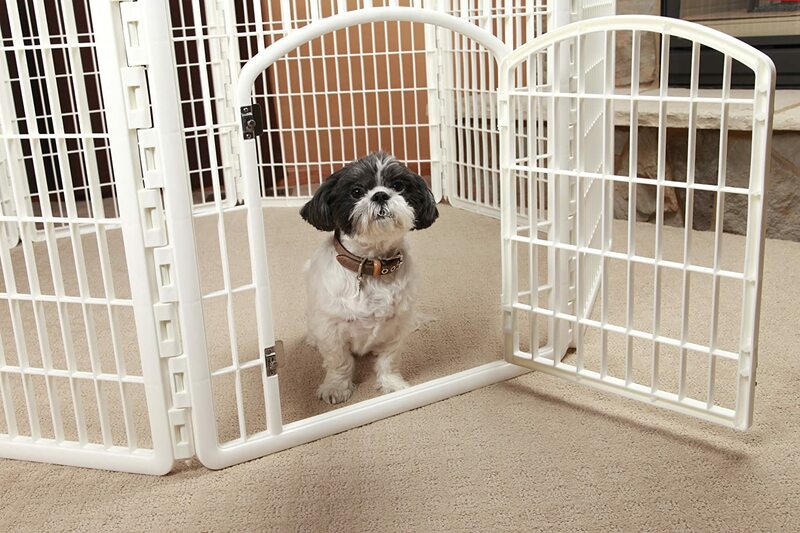 Thanks to the Iris 8 Panel Exercise Pet Pen With Door, your pet can always accompany you pretty much everywhere you go. If you wish to create more space, then you can attach the 8-Panel add-on to it. It is made up of strong and sturdy heavy duty material. Since the material used is plastic you need not fret over rusting and other issues that arise with corrosion. The best part of this playpen’s design is that it can never rust. 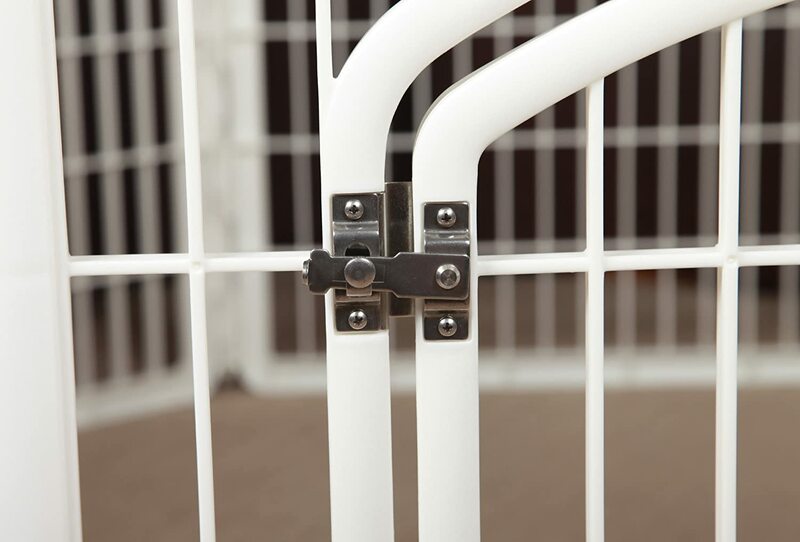 You can fully interlock the panels with the rods for an enhanced safety. You can also position the pens in a variety of shapes. This product is extremely beneficial if you are crate training a puppy. Although it is mainly used as an area to exercise. If you are worried about scratches on the floor then let me tell you that this playpen contains a rubber foot to protect the floor. It is easy to assemble even for a single person. All you need to do is follow the instructions carefully. Once you do, you are good to go! Moreover, it is available in so many beautiful colors that you can easily match it with the interior of your home. (1) Small dog breeds- Yorkshire Terrier, French Bulldog, Pomeranian, Chihuahua, Pug, etc. (2) Medium dog breeds- Dalmatian, Australian Shepherd, Labrador, etc. (3) Large dog breeds- Siberian Husky, Alaskan Husky, St. Bernard, Alaskan Malamute, Samoyed, Mastiff, etc. The IRIS Exercise Panel Pet Playpen with Door is suitable for puppies of all breeds, all medium and small dog breeds and some large breeds. Although I would recommend you refrain from using it with fully grown large dog breeds as it will make them feel confined. 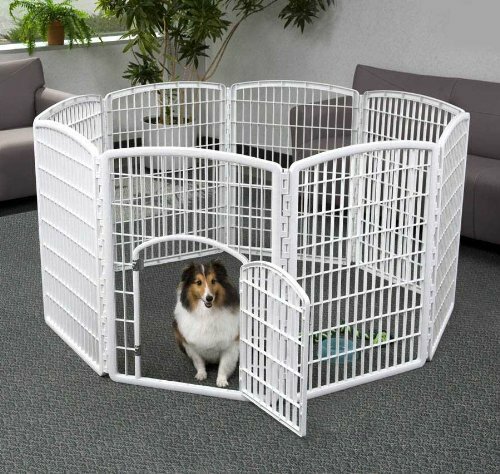 The Iris 8 Panel Exercise Pet Pen With Door is quite spacious. The 21 square inches of space provides your pet to play around and get some exercise. Moreover, when he is tired, he can curl up and relax at ease. The Iris 8 Panel Exercise Pet Pen With Door is available in 9 beautiful colors- blue, brown, chrome, gray, green, pink, red, white, and blue moon. The measurements of the panel are 24.6 inches Wide x 34 inches High. The door measures 14.5 inches in Width x 20 inches in Height. The bars are 1.5 inches apart. The dimensions of the Iris 8 Panel Exercise Pet Pen With Door are 63 inches L x 63 inches W x 34 inches H.
If you are not careful with it assembly, it can collapse. This can hurt you or your dog. It can get a little wobbly when you open the gate. The IRIS Exercise Panel Pet Playpen with Door is not as stable as it claims. 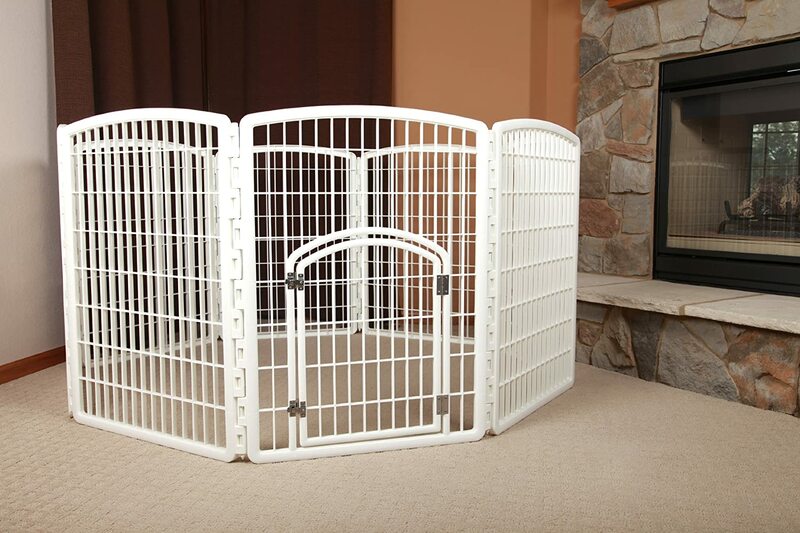 If you have a heavy or super active dog, then it can easily push around this playpen. So, I wouldn’t recommend it for such pets. If you want a fully customizable, portable, lightweight and versatile playpen for your dog then the IRIS Exercise Panel Pet Playpen with Door is a perfect choice. (1) Dog Playpen is a useful tool – to find out more visit the home page.